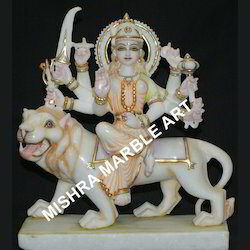 We also provide an extensive range of Maa Durga Ji Marble Idol to our clients as per their requirement. 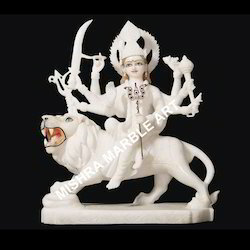 This statue is carved using best grade marble and ideal to keep in worship room. Our range of statue is fully colored by our experienced professionals and acknowledged for highly finishing. We offer this statue at competitive prices. 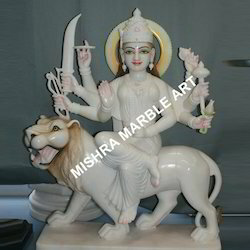 We bring forth for our clients marble stone Durga Ji statues. The craftsmen use their best skills for depict the goddess in her complete glory. 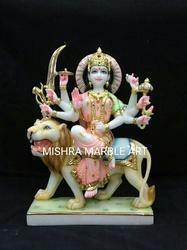 This statue is carved on pure white marble stone and painted using soft combination of pastel colors. Our clients can avail the range at affordable price rates. 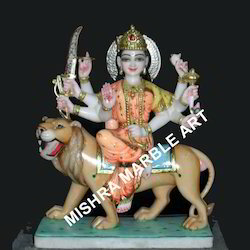 Our organization also offers a superior range of Maa Durga Ji Statue to our clients in the height of 2.5ft. In this statue, durga has eight hands and six hands carrying some ornaments. These are exclusively crafted by our experts and meet the individual requirement of our clients in the best possible manner. 1st grade pure white marble with beautiful face expression. This marble deity in Pure White Marble. 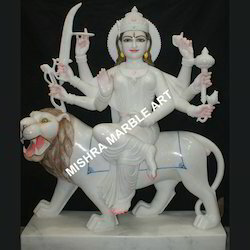 We offer a wide range of Marble Durga Maa Statue to our clients. In this statue, Goddess Durga is sitting on lion and well decorated. This statue is also acknowledged for the smooth finishing and light weight features. It can be also placed in temple and house for worship purpose. This Statue is also known as Ambaa Mata, Durga Mata and Vaishno Devi Mata. 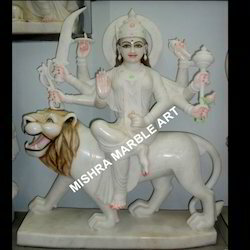 Intricately carved in pure white marble stones our Maa Durga Ji Statue are demanded by clients across the globe. Apart from the creative usage of pastel colors our craftsmen undertake minute carvings with extreme precision. This is the reason that makes these statues shine and bear a beautiful appearance. 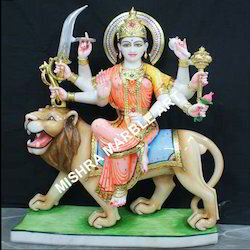 We have in store for our clients Durga Ji Idol. These are intricately designed on pure white marbles. We use hand tools to give detailed attention to facial expressions. Offered at industry leading rates the products are reckoned for their brilliance and shining appearance. 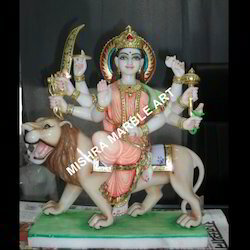 A Moorti of Durga Ji available in colour. This collection is designed by our expert craftsmen & designers and it offers an superior quality and durability. 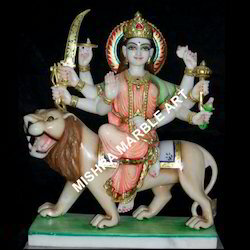 We offer an exclusive range of Durga Devi Ma statue. 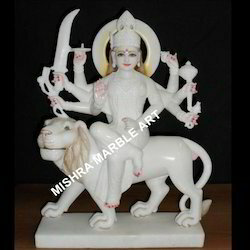 We offer an exclusive range of statue of Mata Durga Ji Statue in white marble. 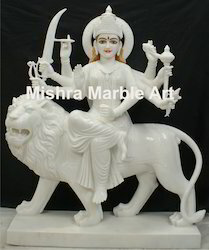 Quarried from some of the renowned vendors of the market, the marbles used for designing attractive Mata Durga Ji Statue have excellent shine & brilliance. The pure white marble stones are painted using soft combination of pastels colors. Owing to their artistic appearance the products are demanded by clients across the globe. 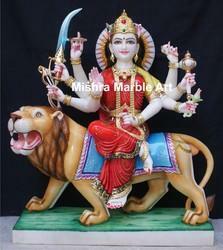 We offer an exclusive range of Durga Mata statue. Looking for Goddess Durga Maa ?